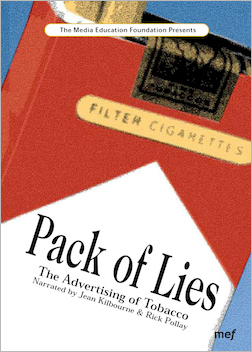 Pack of Lies reveals, with powerful insider information, the deception of tobacco industry claims that they do not seek to addict children to nicotine. It provides important analytical background from which to view the current debate. Jean Kilbourne is a nationally recognized researcher and lecturer on media, advertising, and health issues. Rick Pollay teaches advertising and marketing management at the University of British Columbia, and has been an expert witness in trials involving the tobacco industry. They team up to provide important insights on the power of advertising dollars to counter the influence of scientific research, to affect news coverage, and to put private profit ahead of public health. "Powerful, persuasive, informative and entertaining. An essential part of any tobacco education program."